Earth’s atmosphere is made up of many different gases, some of which are “greenhouse” gases. They are called that because they effectively act like a greenhouse or a layer of insulation for Earth: they trap heat and warm the planet. For the past couple of hundred years, human activities (such as burning coal to generate electricity and fuelling our vehicles with gas and diesel) have been changing the atmosphere by adding a huge volume of greenhouse gases. This has caused the greenhouse effect to become stronger, and is making the planet warmer. Sunlight warms the planet. This heat naturally tries to escape back to space. But because our planet has an atmosphere containing greenhouse gases—especially carbon dioxide, methane and water vapour—some of that heat is trapped by the atmosphere. 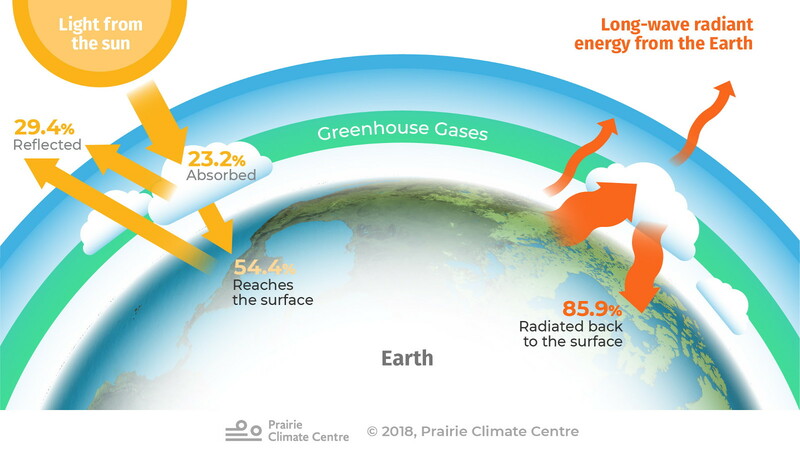 One way to understand how the greenhouse effect works is to think of the atmosphere as a bathtub, where the water pouring in from the tap is like the energy coming in from the sun, and water going down the drain is like heat radiating out into space again. If the same amount of water goes down the drain as comes in from the tap, then the water level stays the same. However, if the drain is closed or blocked, more water will come into the tub than drains out, and the tub fills more and more, until it overflows. As we add more and more greenhouse gases to the atmosphere, it’s like blocking more and more of the drain: heat energy starts to build up in the Earth’s climate system just like water starts to fill up the tub. Read More: Why are only some gases “greenhouse” gases? Everything in the universe emits energy in the form of what we generally refer to as ‘light’ or radiant energy; some kinds of light are visible to the human eye and others are not. Gas molecules in the atmosphere, especially carbon dioxide, methane and water vapour, are essentially transparent to the visible and non-visible light emitted by the hot gases of the sun. That is, sunlight passing through the atmosphere is generally not absorbed by these gases. However, these gases are quite opaque to the kinds of non-visible light emitted by the relatively cool (compared to the sun) entities in our system: the ocean, the land surfaces, the vegetation, the atmosphere itself, and so on. In general, we refer to the energy emitted by these surfaces as thermal infrared radiation, or heat. When the gas molecules are struck by the space-bound heat, the energy is absorbed by the molecules, which then have more energy to radiate their own thermal infrared radiation in all directions. The heat that they send downwards is energy that the Earth’s has to keep it much warmer than it would be without the presence of those greenhouse gases. This process, in a nutshell, is called the greenhouse effect and the gases involved are referred to as greenhouse gases (GHGs). For thousands of years, greenhouse gas concentrations remained relatively stable, and so did earth’s overall temperature (see our “Past Climate Change” page for more information). Unfortunately, the sharp increase in greenhouse gas concentrations caused by industrial activity during the past couple of hundred years has thrown the system out of balance, causing the planet to heat up. Humans are currently releasing more than 30 billion metric tons of carbon dioxide into the atmosphere every year. This is a huge amount, but how does it compare to natural carbon sources? Every year, many hundreds of billions of tons of carbon dioxide are released by natural processes on land and in the ocean. But nature also extracts carbon dioxide from the atmosphere, maintaining a balance between sources and sinks over the long term. For example, forest fires emit carbon dioxide into the atmosphere, but when trees grow they remove carbon dioxide from the air. The oceans are a particularly large carbon sink; over one-quarter of the annual human emissions of carbon dioxide are absorbed by the oceans . Overall, natural systems absorb slightly more carbon dioxide than they release, which should be resulting in a gradual lowering of the concentration of greenhouse gases in the atmosphere. However human activities have pushed these natural processes out of balance: our emissions are currently outpacing Earth’s natural ability to remove and store carbon, causing greenhouse gas concentrations to increase . Canadians tend to not think twice about throwing organic material into our household garbage bins. However, this garbage usually gets piled up and compressed in giant landfills. Under these conditions it produces methane gas (another powerful greenhouse gas) as it decomposes. The emissions that come from landfills in Canada is large: about triple the emissions released by air travel . More and more cities are initiating composting programs to help with these emissions. And some landfills are being retrofitted with methane capture systems that prevent this gas from escaping into the atmosphere. Huge amounts of greenhouse gases have been released as an accidental side effect of how we built our modern world’s infrastructure and economy. Cutting back on emissions will demand a wide range of approaches, ranging from replacing fossil fuels with renewable energy, to rethinking how we plan and build, to figuring out how to be more productive with fewer resources. The climate threat is real, but so are the exciting possibilities to find new and creative approaches to living together with health and prosperity within the limits of the natural world. We need to demand and support collective action in our communities, cities, provinces, Canada, and the world as a whole. Read our “Take Action” page to learn more about how we can reduce our impact on the climate as well as better prepare ourselves for the changes ahead. Environment and Climate Change Canada. "Climate Change: the Greenhouse Effect"
Climate Lab Book. "Earth’s energy imbalance"
UCAR Centre for Science Education. "Molecules vibrate"
World Meterologocal Organization. Greenhouse Gas Bulletin [PDF] (October 2017). Environment Canada. 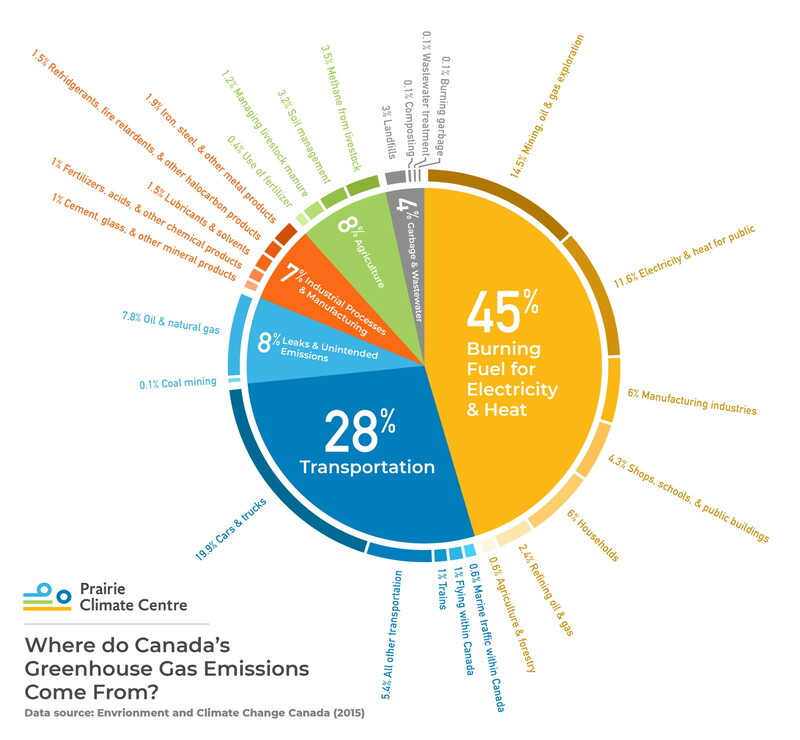 Canada’s Emissions Trends.